Located in Armory Square, the SKY remory is in the heart of Syracuse. We will be located on the 3rd floor. Parking is available in the structure next to the entrance. 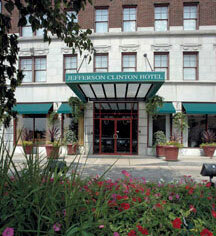 There is a block of rooms reserved for our guests at the Jefferson Clinton Hotel, only steps away from Sky ARMORY. Parking is available right next door in the Clinton Street Garage. Bring your ticket to the Sky Armory coat check for validation. To book a room please call 315-425-0500 and reference the McArdle-Benzinger block to reserve your room. Please book your room no later than 45 days prior to May 18th.